By Paul Stuttard, Director, Duxbury Networking. In Southern African today, organised tax and customs and excise evasion schemes proliferate, impacting the tobacco, textile and alcohol industries, among others. In addition, illicit financial flows and VAT fraud are rife, together with counterfeiting and human trafficking. Drugs, arms and wildlife smuggling represent big business opportunities for criminal syndicates. That said, illicit trade is a global problem. According to the World Economic Forum, the value of illicit trade is close to $3 trillion, equal to 10% of world trade and between 8% and 15% of global GDP. Acclaimed author Louise I Shelley says "the most advanced forms of illicit trade have broken with all historical precedents and now operate as if on steroids, tied to computers and social media". John Reiners from Oxford Economics, a market analytics organisation, is on record as saying that, thanks to new technology, it is now easier than ever for forgers to organise and expand their businesses. In the coming years, with advanced manufacturing, 3D printing and AI, this will continue. Those working to combat it need to invest in the latest techniques to keep up. Undoubtedly, technology is a two-edged sword. While the latest advances in telecommunications, IT and globalisation boost business operations, they are also increasingly used by criminals to boost illicit trade. Regrettably, there seems to be little in the way of an effective, consistent international technology-driven response to illicit trade. It is left to smaller organisations comprising concerned individuals and affected groups to deal with the problems on a piecemeal basis. By allowing digital information to be distributed but not copied, blockchain technology is creating a backbone for what is being described as "a new type of Internet". Let's take the tracking, tracing and authenticating of products as an example. These tasks are central to the main technology-driven strategies deployed in the fight against illicit trade. But they are left to manufacturers, freight forwarders, logistics companies, distributors, retailers and others to execute. Their weapons include active and passive tracking of goods at various stages of the supply chain and the use of overt and covert labelling and coding systems and processes. GPS technology plays an important role, particularly when it comes to the tracking of transported goods over long distances. Fortunately, those in the fight against illicit trade are about to get a welcome addition to their weapons arsenal. Tracking is poised for a dramatic improvement in effectiveness, thanks to LoRaWAN (long range wide area network) technology. LoRaWAN technology supports small sensors which use a tiny fraction of the power of conventional sensors, giving them a life span of up to five years on a single charge. A single LoRaWAN gateway with a range of up to 30km (line of sight) can track tens of thousands of devices. Significantly, greater distances have been achieved in tests, pointing to a technology that will evolve. According to its advocates, LoRaWAN will make tracking affordable and easy to deploy. Significantly, it will produce an end-to-end supply chain audit trail designed to combat theft, with the spin-off benefit of improved service delivery. Many in the IT industry see LoRaWAN becoming the de facto technology for the Internet of things (IOT) as it enables smart IOT applications devised to resolve some of the globe's toughest challenges, such as energy management, natural resource reduction, pollution control, infrastructure efficiency and disaster prevention. Moreover, LoRaWAN is underpinned by blockchain technology (well known for its association with Bitcoin and Ethereum crypto-currencies) which has the potential to overcome these as well as a host of tracking/distribution/management challenges as a result of its distributed, secure and private nature. A blockchain is a decentralised, distributed and public digital ledger. It records transactions across an infinite number of computers, preventing records from being altered retroactively without the alteration of all subsequent blocks. When blockchain and IOT technologies are integrated, the sharing of services and resources is facilitated, leading to the creation of a "marketplace of services" between devices. This allows users to automate several existing workflows in a cryptographically-verifiable manner. It works like this: A network of computing nodes makes up the blockchain. Every node is an "administrator" of the blockchain and joins the network voluntarily. Together they create a powerful second-level network, representing a new vision for how the Internet is able to function. Blockchain technology has already racked up some successes in combatting illicit trade in "blood diamonds" which are mined in conflict zones, often using child labour. The proceeds of these diamonds are frequently used to buy arms on the black market. The key to success in this battle is the use of blockchain's decentralised ledger which can trace diamonds from the mine to a retail outlet. A unique digital fingerprint, using digitised attributes and a digital passport, identifies each diamond and builds its provenance or "reputation". Because blockchain's immutability ensures records are permanent and cannot be changed, they effectively become a certificate that authentically records the completed journey of each diamond. Could blockchain technology help eliminate illicit trade in other industries? Samantha Radocchia, co-founder of Chronicled, a blockchain-based smart supply chain network, is optimistic. She writes that "[product] diversion and counterfeiting are the most frustrating roadblocks legitimate companies face. Crucially, blockchain is poised to reduce these issues in supply chains around the world." Blockchain's potential has only just begun to be tapped. Paradoxically, Africa stands to benefit most because, largely unencumbered by entrenched competing technologies (as are developed countries), it is as ready to rapidly adopt blockchain technology for trade facilitation in the same way as Africa has adopted cellular rather than land-line technology for communications. Paul Stuttard is a director of specialist distributor Duxbury Networking. 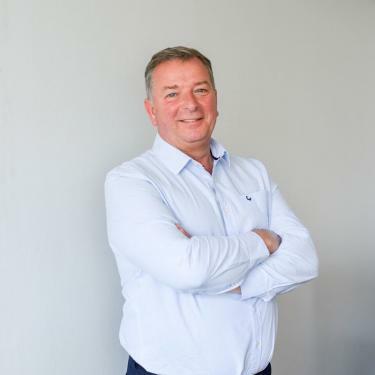 Currently Cape-based, he has been with the company for 29 years and has extensive experience in the IT industry, particularly within the value-added distribution arena. His focus is on the formulation of future-oriented network optimisation strategies and business development objectives in collaboration with resellers and end-users in Southern Africa.